A couple of in progress shots and the final model done. It took some time to clean up in the intake and remove the splitter plates. The Hasegawa kit has the GSB version of the Jolly Rogers but I wanted to do the gull gray version so I had to scavenge decals from my spares box. Well Michael, I just saw the extended finish, I also saw Bryan's effort. I might just as well bin mine when I get home. Think I'm gonna stick with Hasegawa's GSB flavor. Peter, Jeff and Brian: spectacular! I love your builds. Michael, thanks for the extension. I wasn't sure I was going to make it. 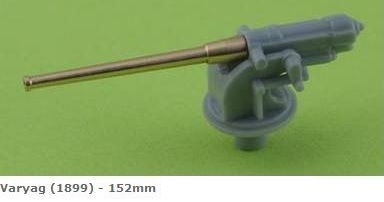 Independently of being Hasewaga and the price tag, most of my model is just... let's call it a classic: Most of the parts are surrounded by flash and has one or more sink marks. 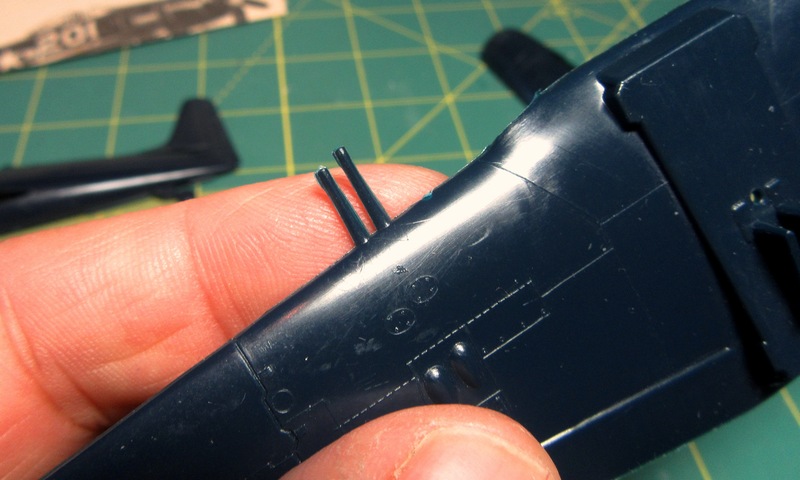 Fit is OK but not great and panel lines are very subtle and they will go after sanding and priming. I wound't recommend the model, it's a lot of work. Mark, looking forward to seeing your GSB Cougar. Then we can have the full set! 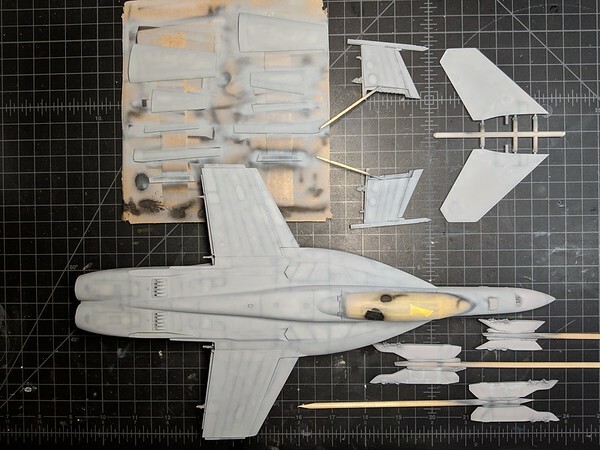 Some progress in my F-14B: Primer on! 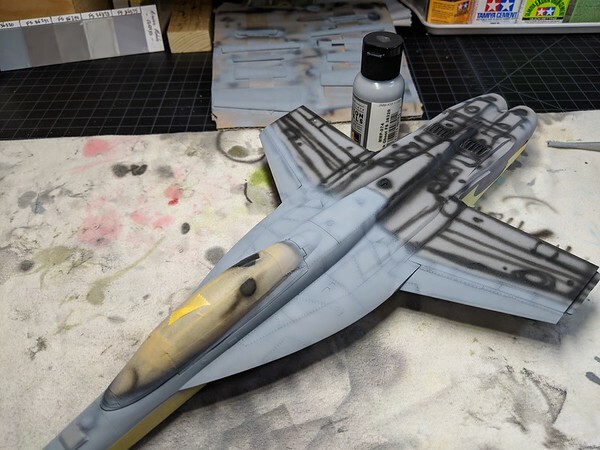 well the painting has begun and i am in the gloss stage so that i can add the numerous decals! Carlos, should be very interesting to see how that looks when the grays go on! well i'm in the home straight here now. this kit hasn't been to bad and has given some nice and bad surprises that i wasn't planning on. the main problem with this kit is the fit of the nose section and the decals. 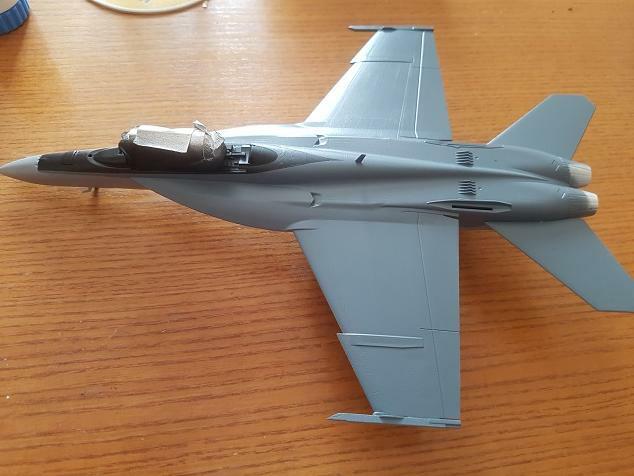 those decals are a nightmare and anyone who is thinking of building this F/A 18 version i strongly recommend getting after market decals these things just do not want to stick to the painted kit! i gave it two coats of clear gloss, i used micro Sol and Set solutions and still these damn decals wont behave. 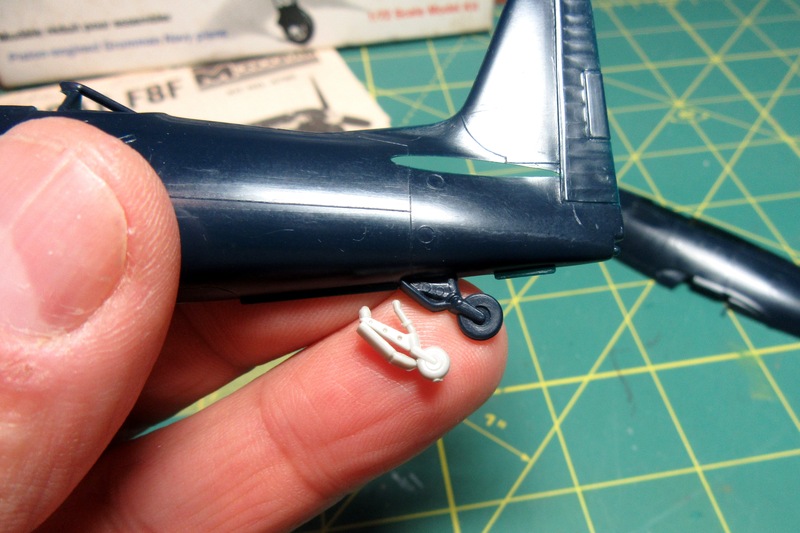 i even tried another trick which is to use Tamiya thinner as a setting solution which actually had greater success than the Micro Sol and Set solution!. anyway i am not going to keep fighting them as time is running out, so all that i need to do now is add the fuel tanks and weapons, i'm not going to cover it in grim or dirt but keep it looking more factory fresh. David, decals look great from here so congrats on taming them. I've put a lot of time in my model this week. (My daughter has chickenpox so I had to spend some extra time home.) 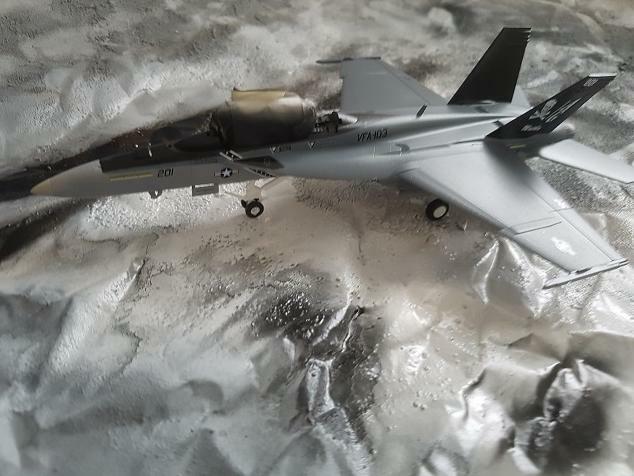 I have painted the exterior of the model and I am happy with it. The pre-shading had mixed results. Red and blue were totally unnecessary, too dark and show through the paint. I had to cover most of the pre-shading effect as a consequence. Yellow and white inside the panels gave a bit of tonal variation and looked great through the grey. Next time no red and blue. The skull and crossbones go on this weekend! Two pic's today to illustrate pre-shading. 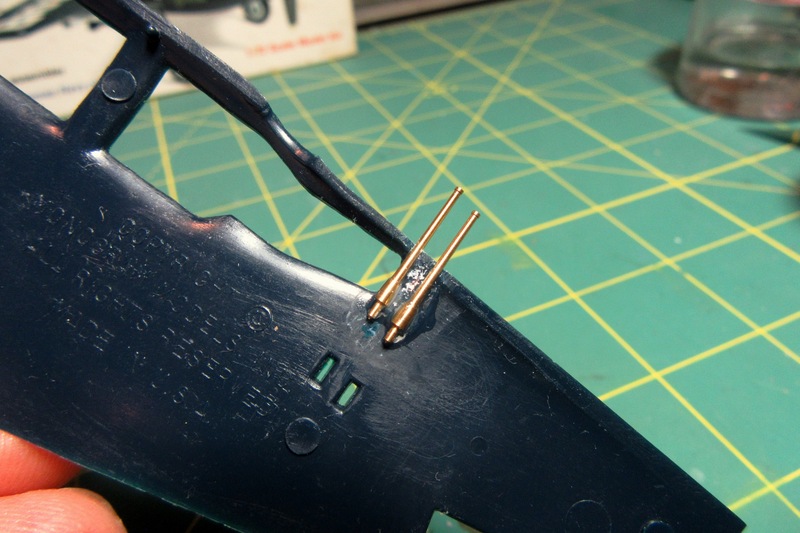 I've completed most of the painting and now working on the little detail work...Landing gear, canopy, ordinance. 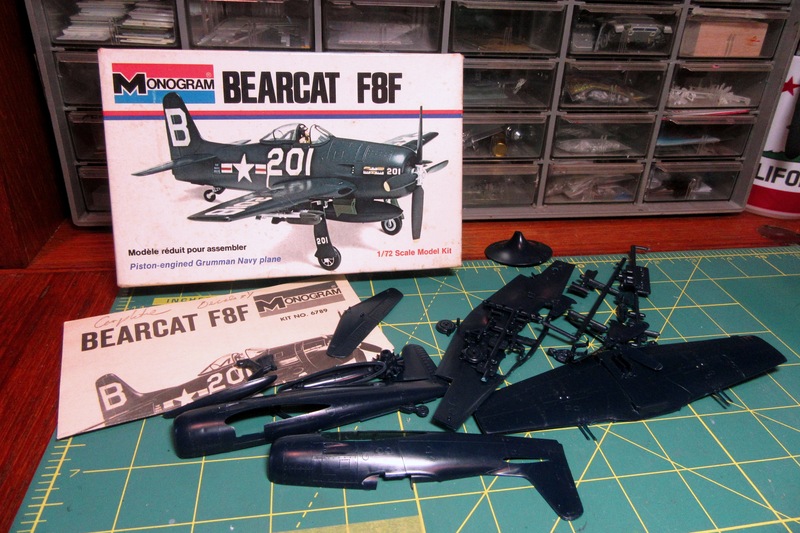 I’m in with Monogram’s 1973 reissue of their Bearcat F8F model from 1967. The markings aren’t right for the “Jolly Rogers,” but I’ll figure that out later. 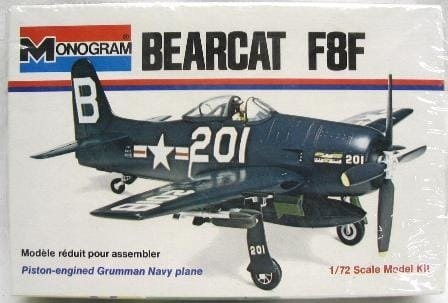 Even with newer releases from Sword and Art Model, the accurate outline and sharp molding of Monogram’s 1967 Bearcat still make it one of the better F8Fs available in 1/72. It does, however, have its weaknesses. 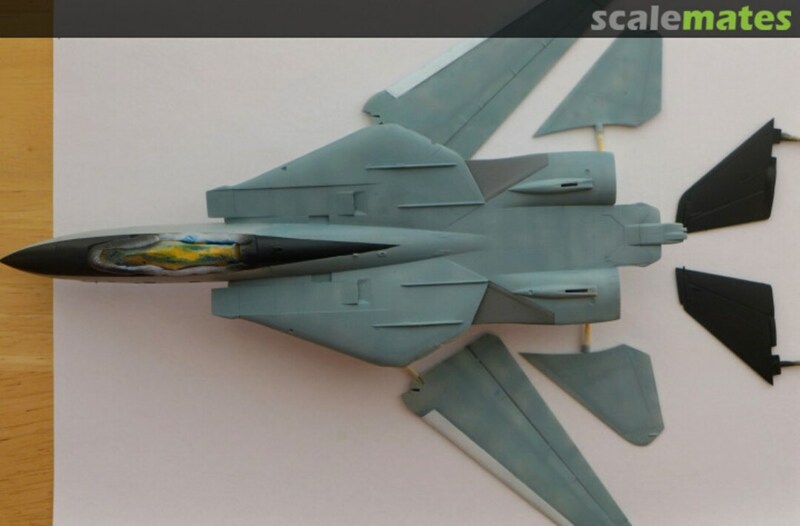 I can live with the very basic cockpit and lack of detail in the wheel wells, but the 20mm cannon flame tubes molded on the wings are just plain ugly. And I was complaining that my model is a classic... Tim, looking forward to see what you do with the model. 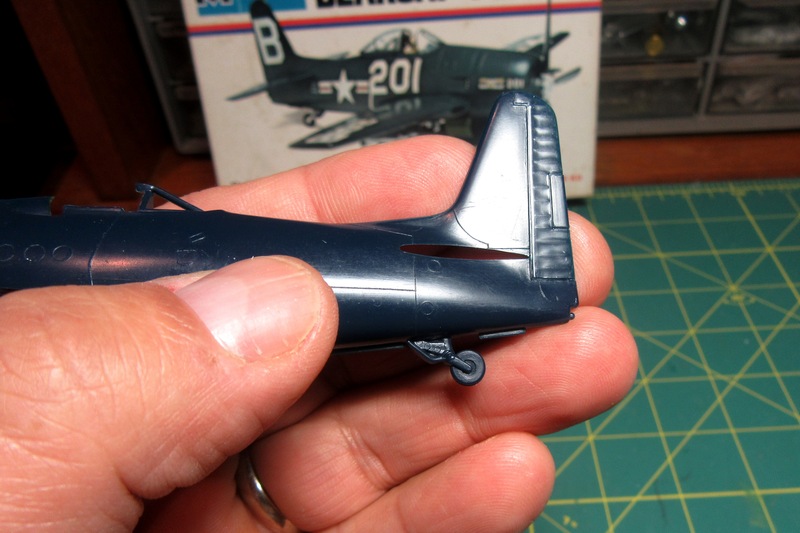 Tim, that F8F-1 is one of my hanger queens. Almost ready for paint, but the 20mm are causing me some concern too. 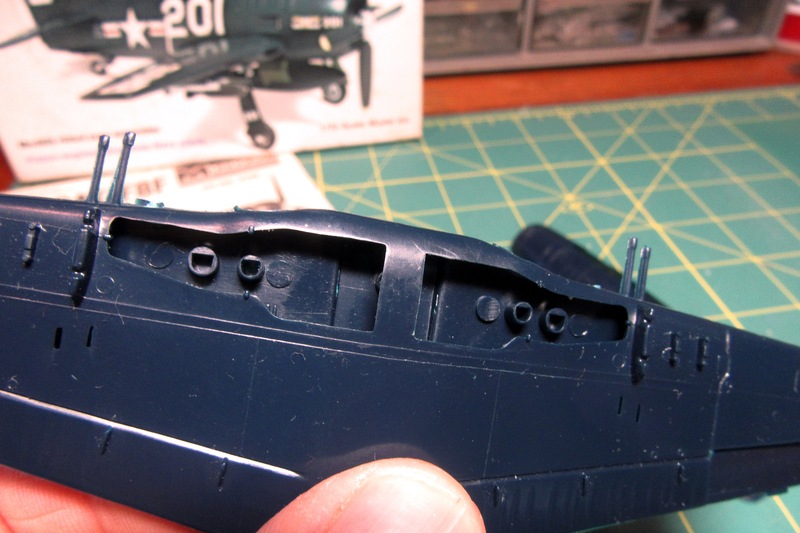 Current plan is to replace them with a set of resin cannons for a Spitfire. Just need to figure out the attachment method. What's your plan? 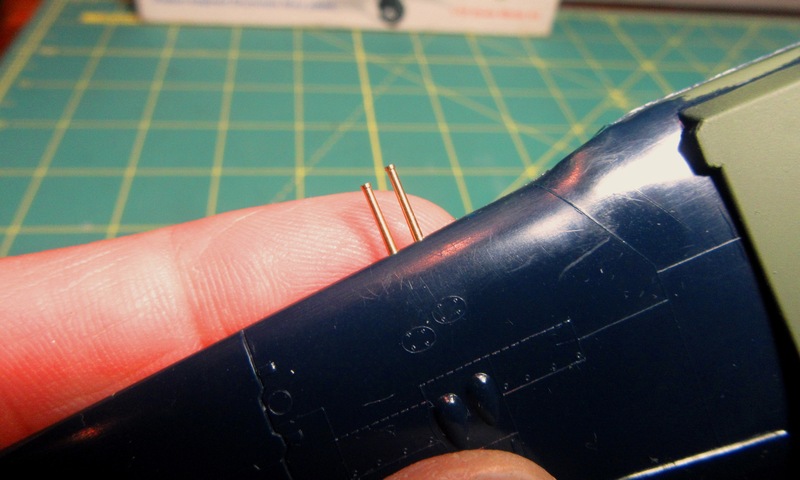 Set in place with super glue, the new tubes will be a big improvement over the kit representations! 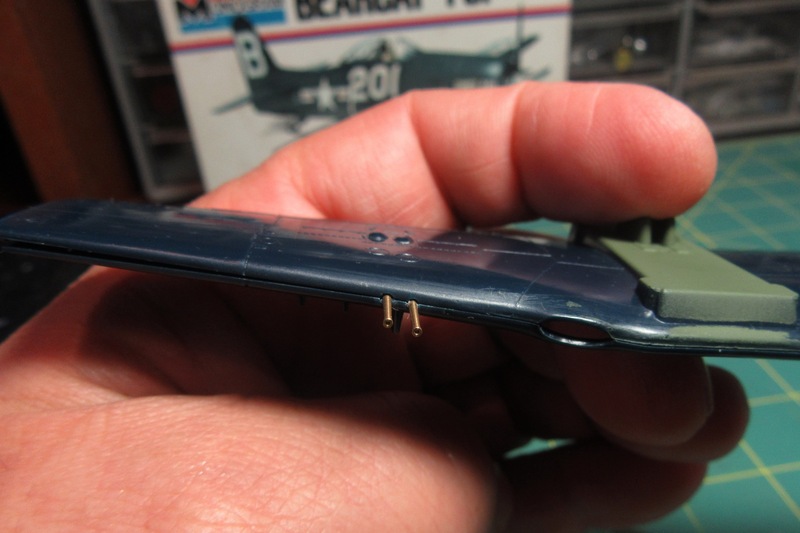 Another simple change will be to replace the tailwheel with a better one from an old Hasegawa F6F. OOPS, I did that wrong. I closed up the wings before I decided the molded on guns had to go. This could be a real challenge. 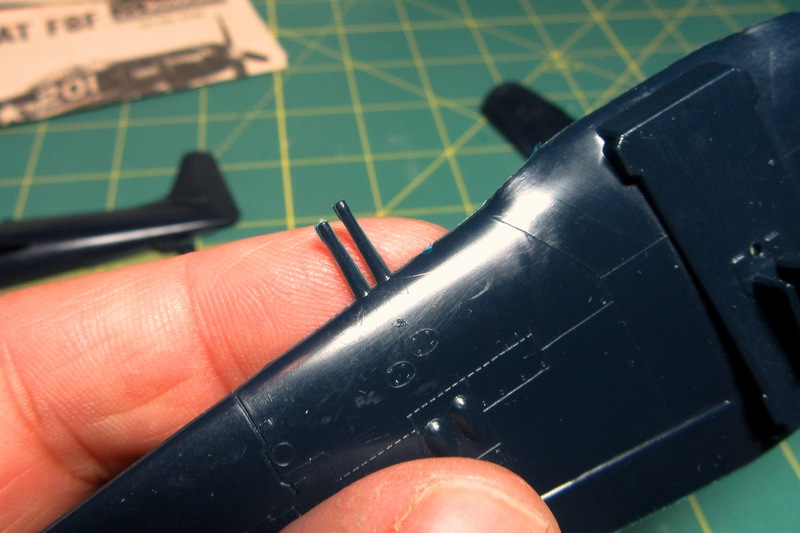 My original idea was to trim off the molded on tubes and replace with these, probably after trimming off the breaches. Well folks, i'm calling this one done. 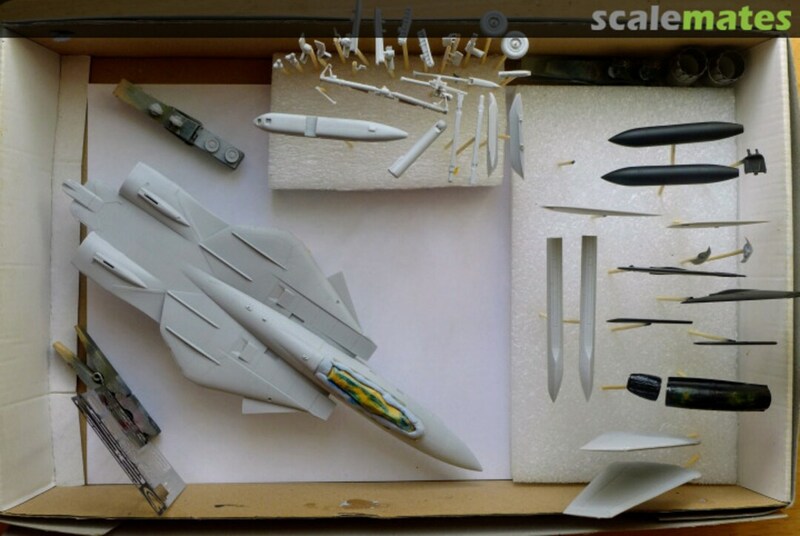 So, this so the Academy 1/72 scale F/A-18 Super Hornet. 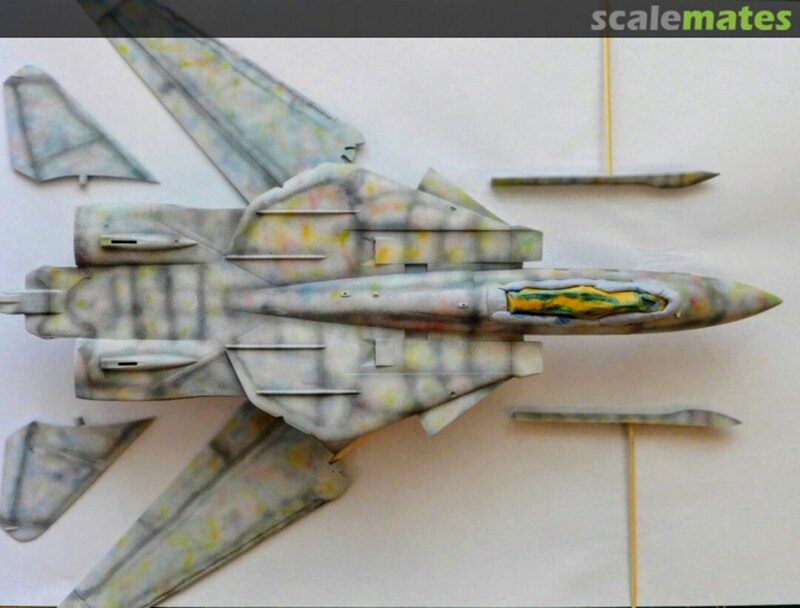 It was an interesting build, i certainly wasn't expecting the assembly to something similar to a Bandai kit although it did need some glue and putty in places. My only bug bear with this kit is the damn decals, they just resist all attempts to be secured onto the kit's painted surface, so if you're gonna get one for the love of god save yourself a load of hassle and buy after market ones.